Hi my pretty people! I know you all have been waiting for me to post about my NYC trip and all my outfit details! I spent the week off of my phone and social media completely. I also didn't have anyone to take my pics/my tripod with me last week. So these are the best pics I have! Lol. I was on the go pretty much all day everyday. I took advantage of the week and explored everything, applied to apartments in the Lower East Side and had a few interviews at Free People and LF Stores! Pretty exciting stuff. I walked almost everywhere, walked 12 miles on my longest day! I went to Times Square, Central Park, 5th Ave, Chelsea Market, and tons of other touristy places. I also wandered around the Lower East Side a bunch because that's where we found our apartment! We found the perfect apartment, just waiting to hear back about our application going through! If so February is move in time! Can't wait to decorate and move to the city! Been searching for this FP jacket everywhere! Literally have looked at over 5 stores for it and I found it at Macy's in the city! Also got these dope refurbished Levi denim mom jeans from Urban! Love love love them! Teddy pea coat look-a-like here! ONLY $78! I wore this cutie outfit around the city on my 12 mile day! Wore these comfy jumper pants from Express (look-a-like here! ), my fave forever 21 Jean jacket, with a white turtleneck, my new faux fur cross-body, and uggies! 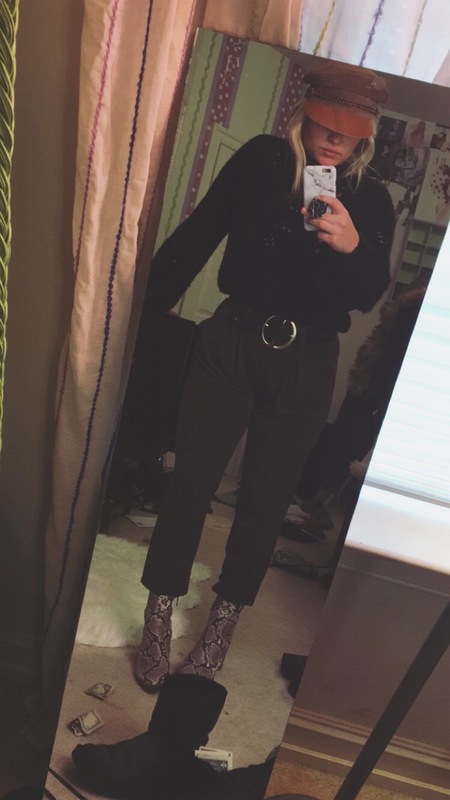 Peep the free people belt here! My faveeee outfit has to be this one! My fave FP jeans I mention in about every post! Paired with an over-sized denim jacket, bell sleeved Free People top, grey ankle socks, orange sunnies, and my faux fur crop jacket (look-a-like)! This was such a fun outfit! Scarf linked here! Also, shop my white marble phone case and black marble popsocket! I didn't end up wearing this one... but I love love it! It was a bit too cold, but it's all linked in this blog post! Steve Madden booties - Click HERE!! Black sweater - purchased from Marshall's, but here is a look-a-like! I never wore this one because you guys gave me a 45/55 poll rating! I do have to say I love the vintage look, but left it at home for the week. Vintage blazer was a hand me down from my grandma - look-a-like here! Another one here. 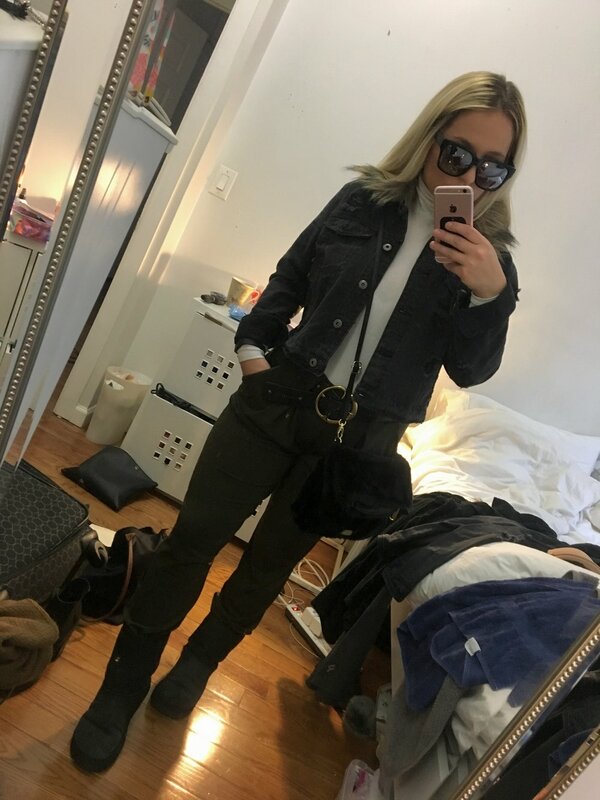 Free People green army jacket! I wore this outfit to my FP interview! Last but not least! Never wore this dope outfit, but here are the details since you all dm'd me about it! Skirt - here! The rest is all linked throughout the post!